April 9, 2019—Superintendent Dr. Marty Pollio has named Walton-Verona Independent Schools Assistant Superintendent Kim Chevalier to be the Jefferson County Public Schools (JCPS) Chief of Exceptional Child Education. Chevalier is a proven leader in this field and has established several programs, in her more than 18 years in education, to help students with special needs. 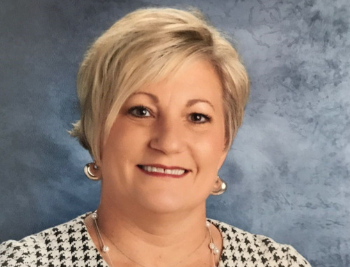 Chevalier joined Walton-Verona Independent Schools in northern Kentucky in 2010 and has also served as the Director of Special Education and the Director of Pupil Personnel. Ensuring that all students are transition ready is a priority in JCPS, and Chevalier has established innovative ways to provide students with opportunities to gain skills to help them be successful after high school. Chevalier established the first Northern Kentucky School Coffee Shop for students with special needs to guarantee real-world, work experience, and career readiness. She has also implemented alternative programs focused on preparing students for a 21st-century workforce. During her time in Walton-Verona Independent Schools, Chevalier also served as the Director of Student Services, Preschool, Gifted and Talented, and School Health. Chevalier serves on the State Advisory Council for Exceptional Children and the Educational Professional Standards Board, and she looks forward to beginning her new position in JCPS. Prior to her time at Walton-Verona Independent Schools, Chevalier also served as the Director of Special Education in Fort Thomas Independent Schools and Assistant Principal at the Regional School Programs, a one-of-a-kind alternative program in northern Kentucky. This new Cabinet-level position is a part of the district’s settlement agreement with the Kentucky Department of Education. Chevalier begins her new position with JCPS on May 6.